Murder by Gaslight: Chloroformed to Death. Early on the morning January 2, 1890, Dr. Arthur Kniffin left to catch a train to the town of Broadway, New Jersey, to look at a piece of property he was planning to buy. Broadway was the home of his wife’s cousin, Emma Purcell, who was living with the Kniffins in Trenton in 1890. She worked there as a typist for the Empire Rubber Works. Dr. Kniffin had seen Miss Purcell at the train depot when he arrived in Broadway— she had been home for the holidays and would be returning to Trenton that afternoon. Though little was taken, the burglary upset the household and the Kniffin's ten-year-old son, Lennie, began sleeping at the home of his grandmother, Mrs. James Murphy. On January 2, with Dr. Kniffin away again, Mrs. Murphy asked her daughter and Emma to stay with her as well. Myra declined, saying she was not afraid; she kept a loaded seven-shot revolver under her pillow. Myra Kniffin was dead. A corner of a quilt had been saturated with chloroform and held over her face. The odor still lingered in the room. Later that afternoon, when Emma Purcell was sufficiently revived to make a statement, she said she was not unconscious when they found her on the floor but felt as though she was paralyzed unable to move her hands and feet. She and Mrs. Kniffin, Emma told the police, had gone to bed at the same time. Both were cheerful and stayed awake talking for a time, then she nodded off. She couldn’t say how long she had slept but was awakened by a touch from Mrs. Kniffin who screamed that there was a burglar pushing open the door. Miss Purcell heard the noise and sprang out of bed, and running to the front window, called loudly for help. One of the burglars seized her then, threw her to the floor, and pressed a wet cloth over her face. That was all she remembered. When she was told that Mrs. Kniffin was dead, Miss Purcell became hysterical. Dr. Kniffin was summoned home by telegraph but not told of his wife’s death until he arrived at 8:30 that night. He was taken to Police Headquarters and extensively questioned about his movements on the previous day then brought to his house to determine if anything had been stolen. While the furniture had been disturbed in the dental office, nothing appeared to be missing. The day’s receipts were usually kept in a drawer there, but Dr. Shannon had taken the cash home with him the night before for safekeeping. While relatives of Mrs. Kniffin, including her mother, believed Emma Purcell’s story of the burglary, the police and the press did not. In a story dated January 3, the New York Times put the word “robbery” in quotes while describing Miss Purcell’s account. The house had been locked, there was no evidence of a break-in, and nothing was taken. Dr. Kniffin was known to be a sporting man who would bet $500 or more on a horse race. That would explain why his house might be targeted by burglars but not why the burglaries always occurred when he was away. To the chagrin of the Kniffin family and their friends, the police were doing nothing to investigate the alleged robbery. The murder became the talk of the town and the rumor mills of Trenton were churning out their own opinions of the case. Dr. Kniffin was a lifelong resident of Trenton, prominent and well known; many in town had stories about the family. It was said that relations between Dr. Kniffin and has wife had deteriorated and he was known to hit her on occasion. Dr. Kniffin would often walk Emma Purcell home from the Rubber Works where she worked, and the two had been seen “in secluded localities together, conducting themselves as lovers usually do.” Many believed that the burglary story was a ruse and that Emma Purcell had conspired with Dr. Kniffin to murder his wife. As the coroner’s inquest into the cause of Mrs. Kniffen’s death began, events outside the courtroom took another sensational turn.. Around 3:30 a.m. on January 7, Dr. Kniffin attempted suicide. Emma Purcell’s brother, David Purcell was staying at the house and he and Dr. Kiffin had been up after 1:00 to see off another relative. Dr. Kniffin told Purcell that he wanted to take a bath before bed. Around 3:30 Purcell heard Dr. Kniffin stumbling to bed and went to see what was wrong. He found Dr. Kniffin vomiting and realized that Kniffin had taken poison; he was also bleeding from his wrist and throat. Purcell gave him an emetic and ran to get help. He brought two physicians back to the house and Dr. Kniffin’s life was saved. The family said that Dr. Kniffin had acted out of grief over the death of his wife, but once again the police and the press were unconvinced. Though Dr. Kniffin had ingested a large amount of the poison aconite, he would have known that effect would be nausea, with the result of eliminating the poison. On his wrist was a slight cut, “a feeble attempt to sever the radial artery” and on the right side of his neck was “another weak attack on the carotid artery.” Both cuts were only deep enough to penetrate the skin. If he had really been intent on suicide, he had plenty of uninterrupted time to do so. 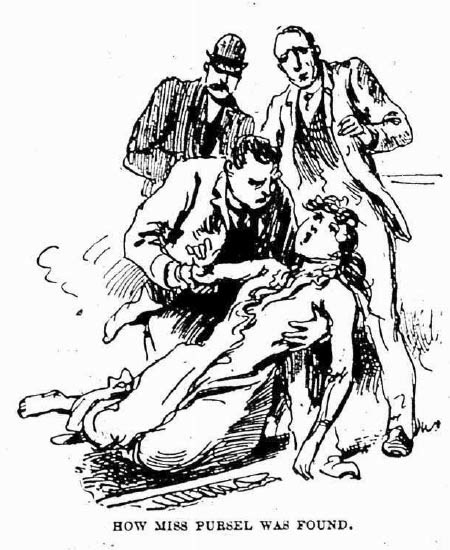 As the inquest proceeded, with more than sixty witnesses scheduled to testify, Dr. Kniffin and David Purcell hired the Pinkertons and a local private detective, to do what the Trenton police refused to do: find the burglars. The people of Trenton were divided in their opinion though most were against Dr. Kniffin. As the story became national news, the police received letters from around the country expressing opinions as to how they should proceed. The inquest into Mrs. Kniffin’s murder went on until January 28, with the courtroom filled to capacity every day. Dr. Kniffin, and Emma Purcell were considered suspects and by the end, Dr, Shannon, Kniffin’s partner was also considered, but James Murphy, Mrs Kniffin’s father, and other members of her family, did not believe that anyone in the household or Dr. Shannan was involved. There was some attempt to identify the alleged burglars but in the end the jury found that Myra Kniffin was murdered by the hand of “some person unknown to the jury.” But the jury had their suspicions and recommend that the case be taken up by the Grand Jury. This was done in February but, to the consternation of the Trenton Police, the Grand Jury did not hand down any incitements. With no one indicted, the Trenton Police’s interest in the case was effectively over, but the press would have one more go-round. The following December the Washington Critic-Record printed an unsubstantiated rumor that Dr. Kniffn had married Emma Purcell and the two were living together in New Brunswick, New Jersey. When confronted, Dr. Kniffin accused the newspapers of persecuting him but did not deny rumor. "Chloroformed To Death!" Trenton Evening Times 3 Jan 1890. "A Very Peculiar Case." New York Times 4 Jan 1890. "Chloroformed To Death." New York Tribune 4 Jan 1890. "A Case of many theories." New York Times 6 Jan 1890. "Kniffin Tries Suicide ." Philadelphia Enquirer 7 Jan 1890: 1. "Murdered in Bed!" 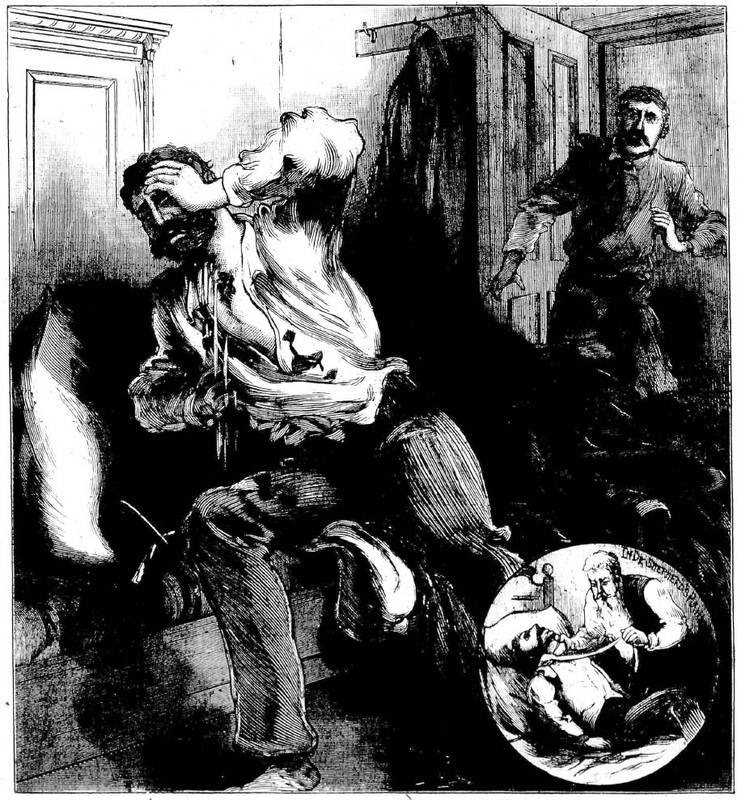 National Police Gazette 18 Jan 1890: 7. "The Kniffin Murder." National Police Gazette 25 Jan 1890. "End of the Kniffin Inquest." Philadelphia Enquirer 29 Jan 1890. "Freed by The Grand Jury." 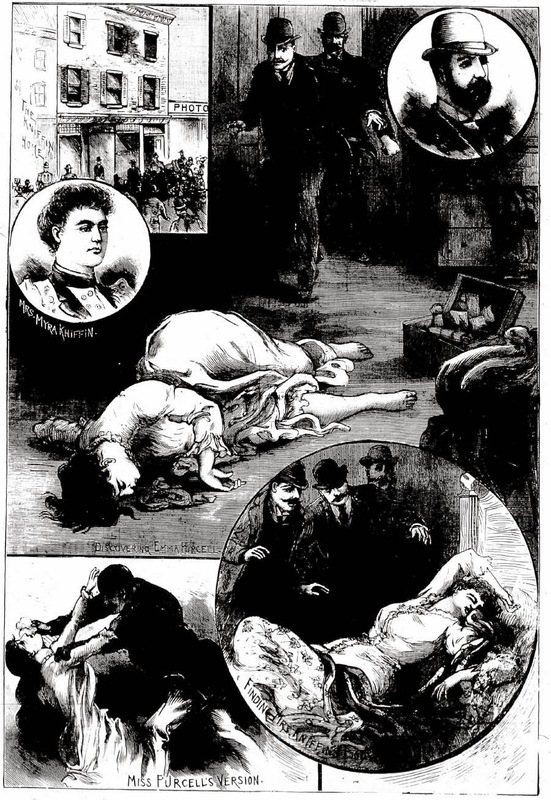 Philadelphia Enquirer 14 Feb 1890. "Kniffin, Pursell and Cupid." Critic-Record 11 Dec 1890: 1. Webster, Charles, IV. "Bygone murder and intrigue." The Trentonian 13 Mar 2012.